Follow-up article: Who put all that sexism into Google’s Autocomplete? Yesterday, I saw an article about a campaign created by the UN women posted in my Facebook timeline. It uses kind-of screenshots of the Google autocompletion algorithm, where a phrase like “women shouldn’t” is completed to “women shouldn’t have rights”, “women shouldn’t vote”, “women shouldn’t work” and so on. These automatic completions, based on occurrences of the Internet’s websites, shall prove how common and widespread sexist ideas still are. I wanted to find out more about these apparent sexist phrases and looked closer at the actual search results of one of the phrases, “women shouldn’t …”. For every autocompleted phrase seen on this poster, I clicked on the first five results and tried to find out the context of that phrase. Quick readers may scroll down to the summary. Reasons why women shouldn’t have rights? Being a girl, I obviously don’t agree with this, but for school, I have to make a speech looking at a popular topic from a different standpoint (the more radical the better). I’m trying to come up with a valid argument about why abolishing women’s rights is a good idea. Any thoughts? Thank you! I think that the men who say that women shouldn’t have rights, should look in the mirror one time, and see how pathetic they are. If Women Have No Rights! A Questionnaire […] If women shouldn’t have rights, what should they do in the case of domestic abuse? Should they merely put up with it? Given the fact that, under a rule of thumb suggesting that women shouldn’t work and have no rights, should she just put up with it? “women shouldn’t have rights”, “Women shouldn’t vote” Usually this is a sort of disclaimer when someone is clearly what they are trying to convince people that they are not, but it fails since well, obviously. It’s entirely false. All five sources make a clear anti-sexist statment. Oh horrors! What if women were allowed to vote? Today is Women’s Equality Day, the 93rd anniversary of the 19th Amendment granting women the vote. It’s a moment to remember not just the activists who doggedly worked to include women in the democratic process, but also that process’s unfinished business–and those who stood in the way. Below, a compendium of caricatures and cartoons (from the Library of Congress) envisioning the dystopia that female voters would create. Why Women Shouldn’t Vote? The society believes that women should not vote because women are emotional, non logical, and want the government to provide health insurance as well as other services a husband would provide so that they don’t have to depend on a man. Although, this is seen as a sexist and chauvinistic view a number of countries in the world still don’t allow women to vote. Janis Lane, the lady leader of the Central Mississippi Tea Party thinks that women shouldn’t be allowed to cast a ballot this (or any) election. In something that’s akin to hamsters eating their young, Lane has turned on her own kind, and is practicing a brand of self-hatred that you just don’t see many people admitting to these days. Can we all stop pretending that our country hasn’t gone wackadoodle now? Please, can we? Because the insanity has gotten beyond difficult to take. We’re treating our Constitution like a cafeteria plan, and it’s not acceptable. No, wait, it’s worse than not acceptable; it’s downright un-American with a capital “U.”Fox News guest and Sean Hannity bud Rev. Jesse Lee Peterson has figured out the root of our problems, he claimed in a “sermon” delivered to the congregation of YouTube. He knows where we went wrong. ‘Vote No on Women’s Suffrage’: Bizarre Reasons For Not Letting Women VoteThere’s a lot that’s flawed about the United States’ voting system: long lines at polling stations, broken machines, voter intimidation, and more. But we can at least take comfort in the fact that, in theory anyway, all citizens in good standing, men and women alike, have the right to vote. This wasn’t always the case, of course. Black Americans didn’t have the constitutional right to vote until 1870, and it took women even longer to gain suffrage: the 19th Amendment didn’t pass until 1920, following a long debate. On this phrase, the picture is not so clear anymore. The first one is clear anti-sexist. The second one tries to explain a sexist attitude while the author him- or herself emphasizes his or her disagreement (“this is seen as a sexist and chauvinistic view”). The third and fourth quote refer to secondary sources, the authors also underline their disagreement. The last one presents historic, almost 100-year old views. LIE #3. WOMEN SHOULDN’T WORK OUTSIDE THE HOME. Work should be a human right, not a masculine privilege. […] If you’re a single mom with bills to pay and you have to put food on the table, are you going to sit by and be like “Women shouldn’t work outside the home, so I’m just going to let this kid starve, we’re just not going to have any electricity…”? Why do Indian men think that women shouldn’t work after their marriage? Culture of India: Why do Indian men feel that women shouldn’t work after marriage? While the first and second are clearly anti-sexist statements, merely quoting direct speech to argue against them, the third and fourth seem to point to a real sexist view in India. Number five again quotes a secondary source to argue against it. Am I the only person unhappy about women boxing? “A boxer is a boxer. I don’t treat them any differently. I don’t see them as women boxers, I just see them as boxers,” said McCracken. “Saying women shouldn’t box is like saying women shouldn’t sprint. Finally, we’ve got something: The first result is a clear primary source with a sexist statement. But the rest remains clearly anti-sexist. Only the third result points to an academic paper counting sexist phrases. The vast majority of the search results contains anti-sexist statements. The sexism is merely used as a quotation to criticize the attitude behind. It is therefore very strange that these autocompleted phrases were used to prove sexism. It seems as if the creators of the campaign didn’t even look at the search results. This doesn’t mean that there is no sexism in the world. It just means that Google’s autocomplete algorithm is a bad way to measure it. 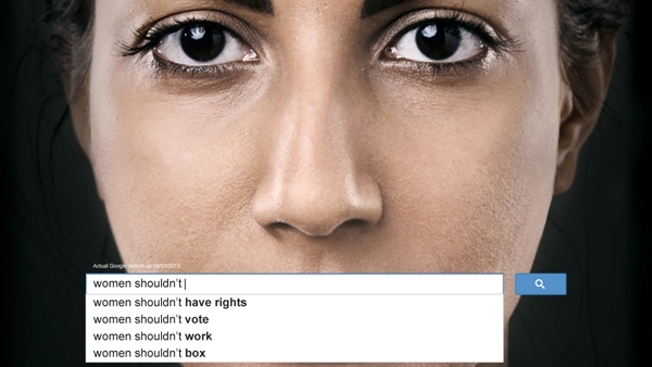 And interestingly, in the meantime the first result of “women shouldn’t have rights” changed: Now it points to an article about that very campaign: Powerful UN Women ads reveal horrifying sexism in Google autocomplete. So also thanks to that campaign, Google will continue to complete “women shouldn’t” with “women shouldn’t have rights”. This entry was posted in English and tagged campaign, Google, sexism, sexismus, UN Women on October 20, 2013 by Georg. Thank you for a great post. If Google searches is the new empirical way to measure the prevalence of an opinion I think we’re all very lost. I feel it’s worth pointing out here that autocomplete is based on the searches, not the actual hits google presents – so your summary of Google hits doesn’t actually tell us much. Also: It’s an ad. It’s pointed and uses simple rhetoric, because it’s an ad. If the UN based a report on google searches, that would be worrying, but they haven’t do that, they made an ad. The search queries that you see as part of autocomplete are a reflection of the search activity of all web users and the content of web pages indexed by Google. So the content of the indexed web pages does play a role. Even if the search activity contains the pure sexist phrases, we don’t know the user’s motivation. One could search for “women shouldn’t have rights” just to see how often it occurs in the web – as I did for instance during the research for this article. Searching for a phrase doesn’t necessarily mean to approve it. Well, the ad contains a message, it says: “Look at the real world and see how many people have sexist ideas!” There’s a “reality-factor” in it. Powerful Ads Use Real Google Searches to Show the Scope of Sexism Worldwide Simple visual for inequality (Italic formatting by me). Try to imagine the ad instead with a photo of a toilet wall or a sheet of paper with a sexist phrase written on it. Would it still work the same way? Danke für den Hinweis, habe dank Googles Keyword Planner jetzt sogar noch was Seltsames entdeckt. in der http://www.youtube.com/watch?v=IuQihwwyoAs wird das Thema auch behandelt. Ab 4:44min … ich denke, man sollte zumindest die UN dazu bringen, hier bei der Agentur nachzuhaken, denn ich habe den Eindruck, dass der Kunde hier gar nicht ahnt, was abgeht. Übrigens, eine Google Trends Auswertung dazu macht auch Spass! Pingback: Ogilvy entlarvt... gar nichts!